UPDATE: Rome, 24 April (askanews) - "I spoke with Alfie's father, Thomas, just now. In this moment, Alfie has an oxygen mask but needs to be transported.. I spoke to Ambassador Trompetta a little while ago. The Team of the Bambino Gesù Hospital has been alerted and is ready to leave in a few minutes. Senator Pinotti (Minister of Defence) is prepared to provide the plane. The situation has to be be resolved in a few minutes." – Marinella Enoc, head of Bambino Gesù pediatric hospital of the Holy See..Alfie continues to breathe on his own hours after being removed from his ventilator. A source close to the family says that he has been "skin to skin with Mum and Dad and is settled." He has been given some liquids and oxygen. The Italians are threatening murder charges if Alfie is left to die. UPDATE - The courts have decided that Alfie cannot go to Italy; even with a plane waiting to take him. Thomas Evans says they are not provding Alfie with food. They will go to court again tomorrow. Please continue to pray. 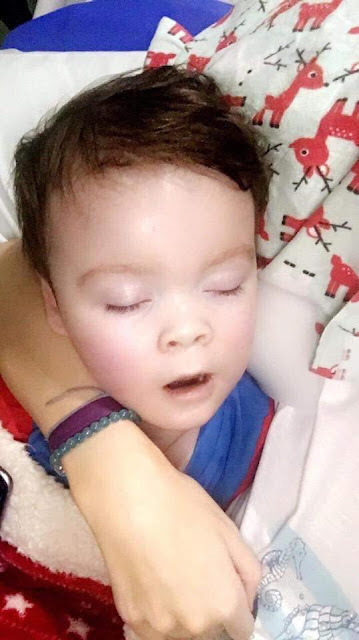 Alfie Evans the young toddler with an illness has had his ventilator giving him constant oxygen removed. This is against his parents wishes. According to latest reports the parents are providing mouth-to-mouth resusitation and he is being given minimal oxygen. Mr. Evans reports that he is turning blue. 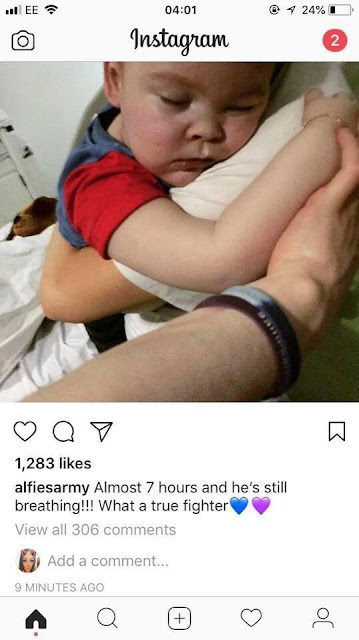 The Christian Legal Centre, representing Alfie's parents, said: "The Italian ambassador has urgently contacted the court with a request for the Italian government to be allowed to intervene in the case and seek the return of their citizen Alfie Evans to Italy." 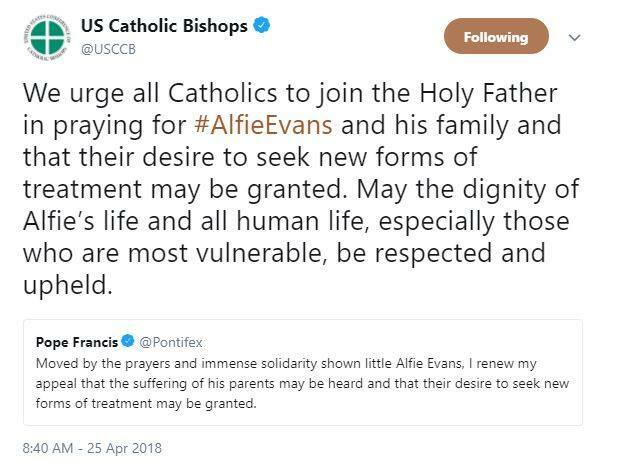 Pope Francis gave his support again for the family earlier by tweeting: "Moved by the prayers and immense solidarity shown little Alfie Evans, I renew my appeal that the suffering of his parents may be heard and that their desire to seek new forms of treatment may be granted."